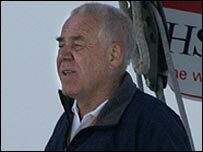 Australian coastguards have asked ships to look out for veteran yachtsman Tony Bullimore's catamaran after communications have been lost. The 102ft Doha 2006 has been out of contact since 7 November when their satellite phone went down, four days after leaving the Maldives. A spokesman for his control centre said at this stage there was "no cause for concern" for the crew. "As it's close to shipping we have asked the coastguard for sightings." Barry Pickthall, running Team Bullimore's control centre in the UK, added: "We know their satellite communication system has gone down so Tony is unable to contact us by e-mail or phone. "We expect the crew to make a stop at Fremantle or another port to get the system repaired. "Since the catamaran should be close to the shipping lanes by now, have asked the coastguard to alert vessels in the area to report any sightings." In his latest attempt the 67-year-old was on his way to Australia with a four-man crew to start an around-the-world solo sailing record. Ten years ago he was rescued from inside his capsized yacht in a remote corner of the Southern Ocean. The former Royal Marine won international fame in 1997 when he was rescued after surviving on "sheer determination, a little water and a little chocolate" for five days in the upturned hull of his boat in the Southern Ocean during the Vendee Globe race.